Where's the Best Burger Joint in Melbourne? It is probably the novelty of the business name, but my immediate answer to this question is Lord of the Fries, which can be found on Elizabeth Street, Flinders Street, Melbourne Central and Melbourne Central. Lord of the Fries is a burger joint franchise with a crazy sauce obsession, however their burgers, while tasty and healthy (to an extent), are meatless - the patty is textured soy protein. So, depending on who you are speaking to, that is either a good thing or a bad thing. We have also had a few WeekendNotes writers give us the word on Grill'd, another 'healthy' burger franchise - you can read Tim Falk's review here and Christine Caruana's review here. But what if you want a burger without the health benefits, would that entail a visit to Danny's Burgers in Fitzroy North - an establishment noted by The Age as serving "a good honest burger," or perhaps Andrew's Hamburgers in Albert Park, which is often proclaimed as Melbourne's best (well, that's the word on the street) - maybe even Burger Edge could be our top Melbourne burger? I am a bit hesitant to call any of these places Melbourne's best - but they are certainly contenders. If you have a favourite burger joint/franchise/grill in or around Melbourne, please let us know about it by leaving a comment below and let us know your top menu items as well. Danny's Burgers in North Fitzroy is an institution and does amazing burgers. I would agree with the ones you have listed. I like grilled. Andrews in South Melbourne make burgers the old fashioned way and are lovely. Without a doubt, Andrew's Hamburgers in Albert Park. Definitely Lord of the Fries like a real meat burger but its not but tastes the same and great. I've been to Danny's and this Although up there with the best, is in my opinion only second. I think the best burger in melbourne is at rock pool bar and grill @ crown. 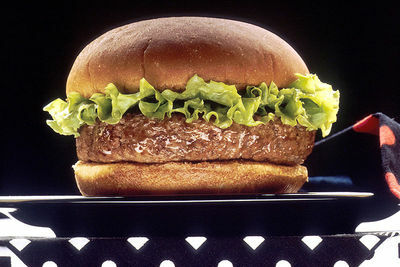 The wagyu burger is unbeatable and after eating it, it is very hard to go back to the same old boring burger joint.